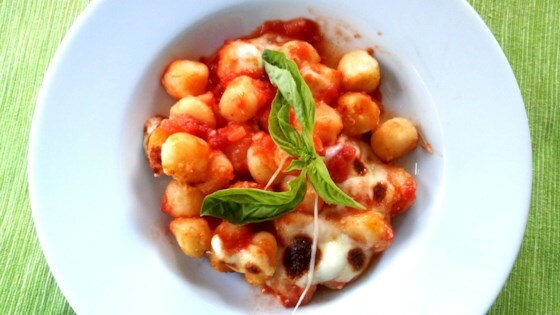 "Known as 'gnocchi alla sorrentina,' this classic Italian pasta dish that uses simple ingredients and tastes delicious. Use homemade or store-bought gnocchi." Heat olive oil in a saucepan over medium heat; cook onion until soft and translucent, about 5 minutes. Add passata and salt; simmer over low heat while you prepare the gnocchi. Bring a large pot of lightly salted water to a boil. Cook gnocchi in the boiling water until they float to the top, 2 to 4 minutes. Drain. Pour 1 ladle of tomato sauce into the bottom of a baking dish. Add gnocchi, remaining tomato sauce, and Parmesan cheese; toss to combine. Arrange cubes of mozzarella cheese evenly on top. Place baking dish in the oven and broil until mozzarella cheese is melted and sauce has slightly reduced, 5 to 10 minutes. Remove from oven and garnish with basil leaves before serving.